Casey Trees' Summer Internship got off to a great star last week. We managed to accomplish a lot in a short amount of time. Day 1 served as an introduction to the internship. After we played a few icebreakers to get to know our fellow interns and staff members better, we heard from various crew chiefs and directors of Casey Trees. 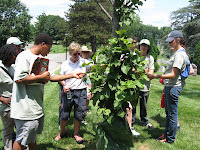 We got a chance to further learn about what Casey Trees does and the mission of Casey Trees, which is to restore, enhance and protect the tree canopy of Washington DC. After this, we went on a short tree walk through downtown and learned about the different types of trees that can be found in that area. After the first day we all were very much looking forward to the rest of the summer. Day 2 started off with an introduction to the various tools and safety equipment that we would be using during the summer and then a lesson on how to properly care for a tree, which includes weeding, mulching, and watering. For the rest of the day, we took care of the trees in the Tenleytown area. 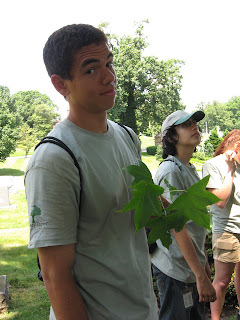 A group tree maintenance competition between the interns added some excitement to the task. Day 3 was bike training day. We started the day by having a certified bike riding educator come speak to us about riding bikes in the city and bike safety in general. This information was important because we will be riding bikes while maintaining trees downtown this summer, which is something new that Casey Trees has added to the internship. 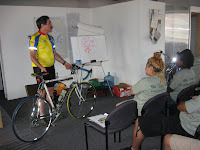 After this we learned how to maintain the bikes that we will be using. We learned how to check the brakes and the gears, and how to change a flat tire. I am sure that all of those things will come in handy while we are riding bikes downtown this summer. Day 4 included prepping the truck for the next day's stewardship event and a walking tour of the Brookland neighborhood. We visited a few of the historic houses in the area and then the Franciscan Monastery. Following lunch we heard from Dr. Tony Mucciardi, who developed the Tree Radar Unit (TRU), a device that can scan the inside of a tree in order to determine the health of the tree without having to do an invasive procedure. Day 5 featured the first stewardship event of the summer - Rock Creek Church Cemetery at St. Paul ‘s Rock Creek. Approximately 15 volunteers helped us care for the newly planted trees. Luckily the heat hadn’t really hit at that point in the morning so we were all able to work pretty comfortably. Remarkably we completed the work in only a couple of hours so we ended the day with a tree walk on the cemetery grounds. It was just full of magnificent trees. Overall, it was a very productive first week and I think we’re all very excited for the next seven weeks.